Welcome to the Customer Support page. The links below lists some of our most requested information. If you don’t see what you need, just let us know. One of the reasons many subscribers prefer The Media Audit is due to its ease-of-use, and its charts & graphs capabilities. The Windows-based presentation-ready software provides more than two dozen different analytic reports that can be easily created and enhanced with graphics, text, and logos for a customized look. Clients also like the ability to snip and paste graphics into PowerPoint, export data into Excel spreadsheets, and the ability to create PDF reports in a one-sheet format. By providing an intuitive and user-friendly interface, marketers are able to spend more time in front of their clients and less time digging through the data. Sample Presentations: Examples of sales presentations actually created by our AEs and researchers that are subscribers. Use the examples to get the creative wheels turning! Windows users will either use a Citrix account to access survey data, or download the software directly on to their computer. Currently, Mac users must use Citrix. Instructions for Citrix are below, as well as a copy of the software for Windows local installs. Call the helpline if you need help with a local install at 832.521.1000 and we will walk you through the process. Easy to follow click-by-click guide to installing our NEW TSplus online app. This option is required for Mac users. The desktop version of The Media Audit for PC users. Whats in a Conversion Ratio? 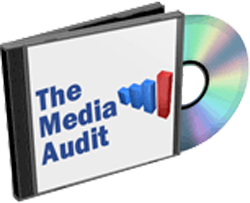 Clients of The Media Audit can download the most current copy of the software “how-to” guide here. The report is in a PDF format. If you wish to have a printed software guide mailed to you instead, please contact our Helpline and we will be happy to mail you a copy. Need some ideas, but not sure where to start? Check out these sample reports and presentations that we’ve pulled. If you have questions, don’t hesitate to contact us! The Media Audit is the most comprehensive, local, syndicated, audience measurement company in the country.